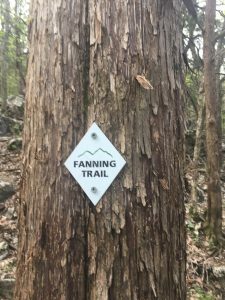 Eleven of us hiked April 9, 2018 from the Fanning Trail head at the Nazarene Church, connected to the Sugar Tree Trail across the highway at Blevins Gap, and dropped to the lower end of Sugar Tree to the two vehicles three of our colleagues had parked that morning. 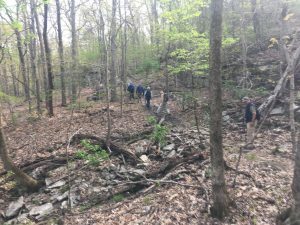 We climbed the Fanning to about 1,300-feet at a brisk pace — this LearningQUEST Monday morning crew truly hikes. And I mean HIKES! Camera in-hand and wildflower journal always at the ready, I bring up the rear. It’s not that this former marathon runner can’t keep up; it’s just that I want to tally species in flower as I go and take advantage of every Kodak-moment along the way. I hope they will continue to indulge me. There they are (photo below right) in the normal position — ahead of me! The hike mostly kept us on the ridge’s west flank, traversing some character-rich terrain. Boulders and ledges made for a circuitous route during our early ascent. As I had seen repeatedly over the past two weeks, purple phacelia is a common resident of boulder-top gardens (below right). We will likely lose this wonderful spring flowering gift soon… as the season progresses. As the two photos below depict, main canopy foliage is becoming more apparent. Phacelia, along with all the other species I have been tallying, are after all ephemerals. Their window of fully sunlit forest floor is closing. To every thing there is a season… and a time to every purpose under Heaven. 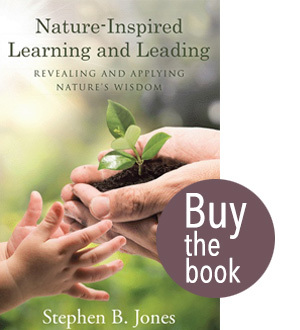 Like the wisdom from Ecclesiastes (and subsequently lyrics used by the Byrds), many lessons from the great works of science, religion, folklore, and Native oral tales are taken from Nature. 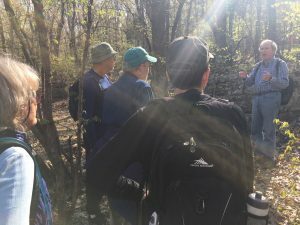 Bruce Martin, our capable hike leader, naturalist, historian, and bearer of mid-hike cookies, possesses and shares wisdom along the way. The sun’s back-lighting provided an ethereal dimension to this stop. Bruce’s sermon on the Mount? We appreciate his dedication and inspiration. 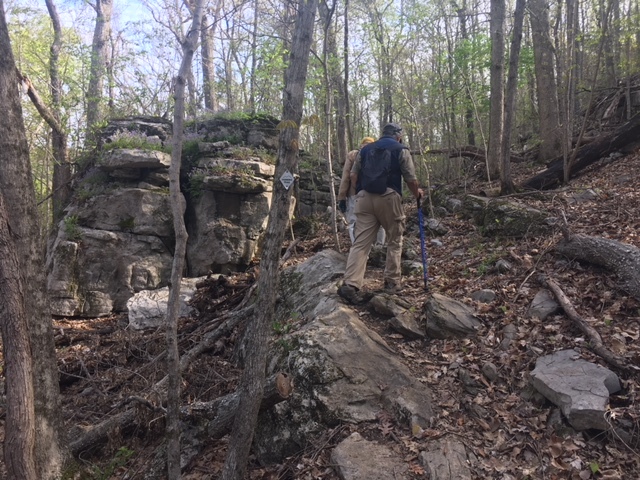 We crossed the highway, entering the Blevins Gap trail system. A nice sign. I wonder low long before vandals inflict a toll? My compliments to the volunteers who faithfully make good things happen. My pox on those who feel compelled to render harm to the good works of those who care and act responsibly. 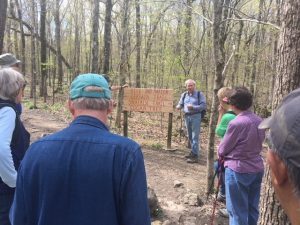 Several paths diverged on the Blevins Preserve, and we chose the Sugar Tree Trail. Not because it was grassy and wanted wear, but because our two return-to-the-Nazarene-Church vehicles were parked at the base. 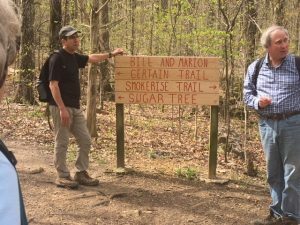 Sugar Tree gradually descended an old rough-worn road, which according to Bruce followed a portion of the Trail of Tears, referencing a sad chapter of American history. I apply the term road quite liberally; certainly not by today’s standards. Yet we did walk past a many-decades-abandoned auto carcass (an early 60s model sedan) and a bit further along, the rusted hulk of an long-abandoned farm implement. I purposely avoided snapping photographs of these scars and visual atrocities. Yes, I know, they are part of the story. However, I was not there to show elements of the glass half empty. 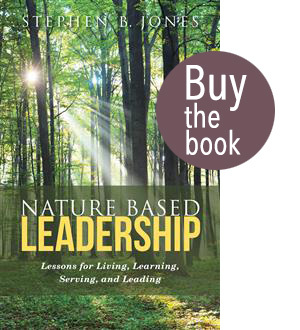 I visit Nature to fill my own vessel, and to translate the journey to educate and inspire others to enjoy Nature… and perhaps embrace and practice an Earth Stewardship ethic. Allow me a side note. 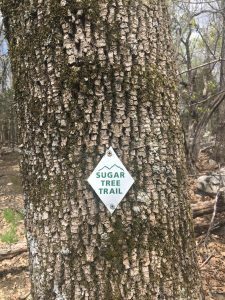 This Sugar Tree Trail sign adorns an ash tree (white ash, I believe). Just as introduced fungal diseases decimated American chestnut and American elm during the 20th century, the emerald ash borer, a metallic green beetle entering the US in 2002 (first noticed near Detroit), is racing across the country. Skeletal dead ash are all that remain throughout Ohio and other Midwest states. The beetle adults nibble foliage and cause little harm. The larvae feed on inner bark, destroying the tree’s conductive tissue, and rapidly proving fatal. The beetle is present in Alabama. Two dozen is a respectable tally. 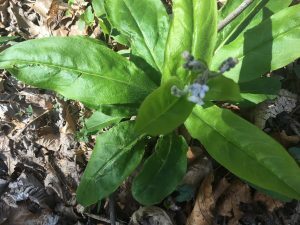 Wild comfrey plants appeared trail-side often along our 4.5-mile hike. This is the only one (below left) I spotted in-flower. Not at all showy, yet still worthy of a pause, some appreciation, and a photo… followed by once more scrambling to catch my compatriots. 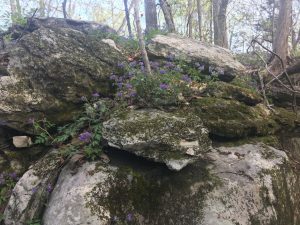 I had seen the wonderful flower (below right) on two prior hikes; in both cases, I saw just a single plant. I struggled to identify it. I found this one along Sugar Tree as I trailed the group. I snapped this image, and later showed it to Bruce. 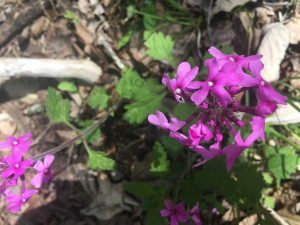 Bruce said, “It may be a verbena.” Sure enough, when I consulted my reference books at home, I verified it as rose vervain (Verbena canadensis). Mystery solved — thanks to our fearless hike-leader! I nearly missed this next one. 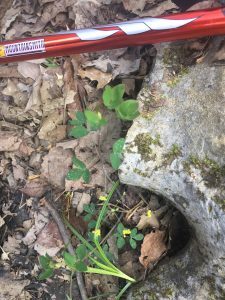 Nestled trail-side and displaying tiny yellow blossoms and miniature foliage, this leaf hop trefoil was the only one I saw. It’s an alien, introduced from who-knows-where, that adds micro-beauty for those willing to look closely. Variety spices every woods walk. Although our entire trek kept us in continuous forest cover, there was nothing uniform in species composition, stand density, site quality, topography, and my impressions stimulated along the way. Were I mapping the forest in the manner I did during my early Union Camp days as a working circle forester in Virginia (early 1970s), I would have kept meticulous notes. Compass in hand, map on aluminum clipboard, and pacing carefully, I noted all facets of site and stand. I could not afford that luxury April 9. It was all I could do to take an occasional photo, make a wildflower tally, and scurry to catch up with the others. Much of our Sugar Tree Trail descent fell along convex slopes with poor site quality. Relatively short trees, and low stand density. We did traverse a bench with concave shape, and likely deeper, more moist, and richer quality soils. The trees reached for the sky, standing tall and straight, with some stems at greater than two-foot diameter. The red oak below is nearly 30-inches at breast height. Same for the dead one standing nearby. Death by perhaps a lightning strike? These are dynamic forests. This stand is (I am guessing) 60-80 years old. Again, were I performing a true stand/forest evaluation, I would have cored a few trees, counted rings, and evaluated growth. I still have my increment borer. However, I am reluctant to core trees without landowner permission. And I would have fallen hopelessly behind my fellow hikers were I to core, ring-count, and make notes. Still, I miss practicing stand evaluation, which is part and parcel of what I do when developing Land Legacy Stories, one of the menu items available through Great Blue Heron, LLC. Nothing lives forever. Witness the standing dead oak above. 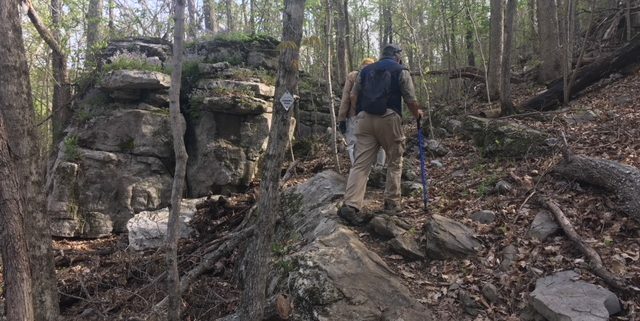 These north Alabama forests are in constant flux. 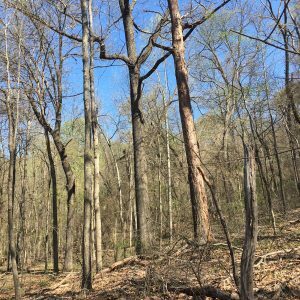 A rough rule of thumb for naturally regenerated hardwood stands — approximately two percent of stems drop out (die) annually. Nowhere along our trek did we not see standing as well as dead and down woody debris. Conditions ranged from a recent blow-down area with large individuals toppled, root-mats lifted to 6-10-feet, to another area along the Sugar Tree where black locust, a pioneer tree species, had by and large fallen from the canopy. The species invades abandoned pasture aggressively, thrives through 20-50 years, and then succumbs, with other more longer-lived species like oak and hickory replacing it. What Creatures Await Those Who Dare Enter These Woods?! Oddities enrich my forest wanderings. Imagine stumbling across this visage in late evening light, having lost the trail and worrying about a night alone! Early European settlers arriving on the New England coast spoke of dark deep woods, foul and repugnant, harboring savage Natives and wild beasts. 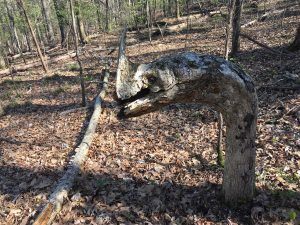 Nice to see that we have a few such wild beasts right here in northern Alabama — let your imagination run amok! 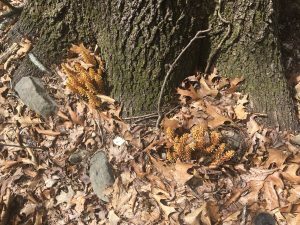 Squaw root is an oak parasite, living in the soil and drawing sustenance from host oaks. The scaly protuberances below will bear flowers later in the spring. I don’t recall previously seeing so many clumping at the base of such a large and seeming vigorous oak. I know too little about the impact that this parasite has on its host. I suspect that the relationship is more a nuisance than a deadly imposition. This particular oak seems anything but distressed. Live a Life passion-fueled, purpose-driven, and results-oriented!